Events > 2018 > December > Holiday Party Giveaway Donation! Our annual Holiday Party includes donation vouchers – $5 donation gets 5 tickets (donations benefit Team River Runner). The big item this year is a Liquid Logic kayak! Winner gets to pick the model, size and color. Note: you must be present at the holiday party to accept all the items except the kayak. 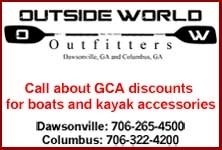 Thank you to Endless River Adventures for sponsoring the Kayak! We also have prizes donated by Pyranha with more to come! Raffle tickets are no longer being sold online. However, raffle tickets will be sold at the Holiday Party on Saturday, December 1, between 6:00pm – 6:30pm. Cash or check only. It won’t let you RSVP any more, but I’m going.